Thank you all so much for signing my petition. The response has been overwhelming. However, I am appealing for your help once more. The political situation within the Labour Party at the moment is absolutely outrageous. The MPs responsible for the ‘coup’ have now turned their attention to discrediting Labour members and Jeremy Corbyn supporters. The narrative within the Labour party at the moment is one that brands all Jeremy Corbyn supporters are as violent thugs and loonies. This sensationalist labelling of people from all walks of life has been adopted and propagated by the main stream media and has led to Labour effectively barring new members and supporters from voting in the upcoming leadership election. The BBC is the main culprit in this subversion of democracy as it is a trusted broadcaster funded with public money, and many people are making supposedly ‘informed’ opinions based on the news stories they cover – or not. My petition was never meant to be a rallying point for Jeremy Corbyn supporters, but a platform for anybody, regardless of their political leanings, to speak out against blatant BBC bias, imparticality and inaccuracy. I have spoken with the Media Reform Coalition and received some very useful advice and practical help with the petition and complaint, but in order for this campaign to have the impact it needs it needs to have at least 100,000 signatures. Please, please, please can you share the petition again? Share it far and wide. If everybody who signed can get just two people to sign the petition we’ll have over 70’000 signatures in total. That’s a huge step towards this goal and will give the complaint more weight. I know that there are gazillions of petitions going round at the moment in response to the outrageous machinations of the coup MPs and the NEC, but we must not forget how the media is influencing public opinion and reaction with it’s campaign of misinformation and distortion. I would also like to ask for those of you who have made individual complaints to the BBC relating to bias, impartiality and accuracy please can you contact me directly at maria.patrick78@yahoo.co.uk. I am collecting complaints and responses and passing them on to the Media Reform Coalition. They will then form part of a professional dossier which will ultimately be sent on to the BBC and OFCOM. I am very happy to do this, as I share her disgust at the very blatant bias of the BBC and the rest of the media, included the allegedly left-wing papers of the Mirror, Guardian, and the supposed, but not really, ‘Independent‘. If you haven’t signed the petition, but would like to, please do so at the address contained in her email. Mike over at Vox Political has an article about a petition by the 38 degrees internet petitioning group, who are presenting a vote of no confidence in the 172 rebel Labour MPs, who are trying to bring down Jeremy Corbyn. The petition asks them to do the decent thing and resign. Mike in his comments about the petition leaves it entirely up to the reader whether to sign it or not. Make your voice heard if you believe our country deserves a credible Labour Party that speaks to the country as a whole. The 172 treacherous Blarites in the Parliamentary Labour Party have shown that they are unfit to represent the Labour Party. They have also shown complete contempt for Labour Party members and supporters. Over the past week they have chosen their personal interests over the people of this country that deserve an effective opposition to our Conservative government. This is a petition is for those who believe that for the benefit of Labour voters, for the benefit of all those millions who need a Labour government and for the sake of our politics, the 172 treacherous Blairites in the Parliamentary Labour Party should do the noble thing and resign. I’ve signed it, because I’m sick of Britain and its working people being betrayed by the Blairite clique that in 20 years of power have tried to turn the party into a carbon copy of the Tories. They stand for everything the Tories do: neoliberal economics based on private enterprise, the selling off of the NHS, and the increasing curtailment of welfare benefits. All of this is imperilling the health and wellbeing of Britain’s people, and destroying its economy. Millions have been forced into poverty through Thatcherite and Blairite policies. And all this has been done for the benefit of their extremely rich backers in big business and the media, like Rupert Murdoch. It’s time it stopped. Now. By allowing former members of Jeremy’s cabinet to resign LIVE on air BBC news reporting has become nothing more than car-crash journalism and should be saved for reality TV and gossip magazines. In supporting the leadership challenge by giving it ‘”undue prominence of views and opinions” the BBC is effectively helping to undermine democratic process . By giving undue attention and airtime to this leadership challenge they are sending a message to the people – that ‘democratic process’ is there to be ignored when it suits the agenda of the establishment. Mike in his piece over at Vox Political reports that the resignation of Stephen Doughty was planned with the aid of Laura Kuenssberg and Andrew Neil. Kuenssberg is already notorious for her bias, while Brillo Pad has form as the editor, in a previous life, of the Economist and the Sunday Times, and was also the editor the weirdo Barclay Twins installed to run the Scotsman. I’ve done so, as I’m sick and tired of the Beeb’s bias, along with the rest of the media. I am also angered by their smug complacency that the viewing public are mugs, who are too thick to notice just how biased they are. As well as the information and resources Michelle has kindly posted as a comment to my piece on the cuts to the service at my local health centre as a result of the government’s creeping privatisation of the NHS, I’m also putting up the list of further resources included in Jacky Davis’ and Raymond Tallis’ book, NHS SOS. This is a very detailed description of the long campaign against the NHS from Maggie Thatcher onwards, and in particular its latest phase introduced by Andrew Lansley’s Health and Social Care Act of 2012. As well as describing the attacks on the NHS, the book also includes chapters on the failure of the press and medical profession as a whole to bring down the whole process of privatisation when they could. It’s a very good book, clearly written, but it will leave you depress and furious. * Keep Our NHS Public (KONP) – runs a national campaign as well as local groups across England. Campaigns for a publicly funded, publicly delivered and publicly accountable NHS. Website: http://www.keepournhspublic.com; Twitter @keepnhspublic. * NHS Support Federation – an independent pressure group that campaigns to protect and improve the NHS, true to its founding principles. * National Health Action Party (NHAP) – campaigning for a publicly funded, publicly delivered and publicly accountable NHS. * Centre for Health and the Public Interest – a new independent health think tank. * Medsin – Student network and registered charity tackling global and local health inequalities through education, advocacy and community action. * NHS Consultants Association – organisation of hospital doctors who support the NHS and campaign to end market-based policies. * OpenDemocracy – ‘free thinking for the world’. Running ‘OurNHS’, a new three-year project dedicated to reinstating a genuine National Health Service in England. * Spinwatch – works for lobbying transparency, promotes greater understanding of the role of PR and propaganda. * 38 Degrees – online organisation that brings people together to take action on the issues ‘that matter to you and bring about real change’. * Health Policy Reform: Global Health versus Private Profit, by John Lister (Libri Publishing, 2013). 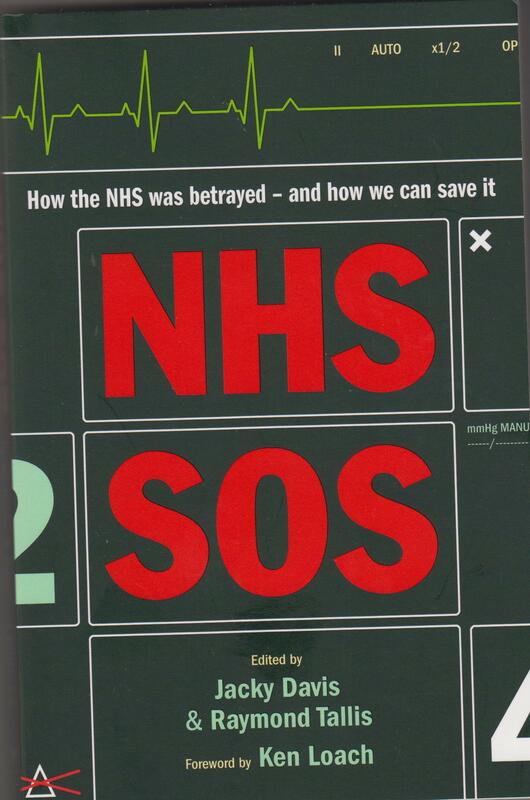 * NHS plc: The Privatisation of Our Health Care by Allyson M. Pollock (Verso Books, 2004). * The Plot Against the NHS by Colin Leys and Stewart Player (Merlin Press, 2011). * Privatising the World: A Study of International Privatization in Theory and Practice by Olive Letwin (Cengage learning EMEA, 1988). * ‘The NHS and the Section 75 regulations: Where next?’ by Bob Hudson. Guardian healthcare network, 30 April 2012, http://www.guardian.co.uk/healthcare-network/2013/apr/30/nhs-section-75-regulations-where-next. This helpful article covers some additional actions that can be taken by opponents of the health care reforms. * Conflicts of Interest and NHS Privatisation, video by the National Health Action Party, http://www.spinwatch.org/index.php/component/k2/item/s441-conflicts-of-interest-and-the-privatisation-of-the-nhs. * Take a Tour of Lansley’s Private Healthcare Supporters. * The Spirt of ’45, a film by Ken Loach, for screenings and availability, see http://www.thespiritof45.com. Craig Murray, the former British ambassador to Uzbekistan and human rights activist, has also weighed in on the accusations of misogyny and abuse in the petition launched against the Beeb’s political edition, Laura Kuenssberg. The petition was a call for Kuenssberg to be sacked because of her egregious and overt bias towards the Tories and against Jeremy Corbyn. It was taken down from the 38 Degrees internet petitioning organisation by David Babb, the man who started it after it had garnered over 30,000 signatures. Babb claimed he was doing so as people were leaving personally abusive and misogynist comments directed against Kuenssberg on the petition. This claim has been repeated by the Guardian, the New Statesman, the BBC, David Cameron, and the entire political establishment. Mr Murray provides a link to the comments left by the people, who signed the petition, to support his statement that there are very few that have any misogynistic content whatsoever. One certainly has, but it was left by a particularly foul-mouthed individual, who also ranted about a number of other subjects in the same obscene way. He states that they show very clearly that the establishment is lying. Here are all the comments on the scrapped Kuenssberg petition. You know, the petition David Cameron condemned in the House of Commons today because it was accompanied by a storm of sexist abuse? Well, here are the comments in their entirety and out of 35,000 people who signed, there is virtually nobody whose comment can be seen as remotely sexist. See for yourselves. Can you spot the one sexist comment I found? The comments show the petition was overwhelmingly signed by decent, concerned people who were sometimes quite eloquent. Also that the petition supporters are gender balanced and several specifically identify as feminists, and as supporters of the BBC. But neither Cameron, the Guardian and mainstream media nor 38 Degrees itself has any qualm about writing off all these decent citizens as a misogynist rabble. The data link was left by a commenter on this site – I strongly suspect a mole within 38 Degrees has got it out. It is absolute proof that the politicians and mainstream media journalists have been pushing a plain lie about the nature of the campaign, and that 38 Degrees have colluded. I’ve a lot of respect for Mr Murray. I can’t claim to follow what he writes, but I respect him for his courageous attempts to stop British involvement with the corrupt regime in Uzbekistan. Murray was Our Man over there, until he made the cardinal sin of alerting his masters in the Foreign Office in London about injustice and massive human rights abuses by the Uzbek regime. As the British government has all too often been very keen to cooperate with murderously repressive regimes so long as it benefits British business or other interests, this principled stance got him the sack. I am very glad to see that it has not stopped him campaigning on these issues. A week or so ago he was featured in a programme about the scandal, broadcast on Radio 4. And programmes like that may well be a casualty of the government’s plans for the BBC, which threaten its independence. Mike over at Vox Political reports that an on-line petition has been revived to get Laura Kuenssberg, the politics editor of BBC news, sacked for her pro-Tory bias. There had previously been a petition to have her fired after she made a bitter tirade against the Labour Party and its leader, Jeremy Corbyn, on the News at Ten on the 6th January 2016. It seems that her outspoken bias against Labour during the council elections has been the final straw, and the campaign to have her lose her job has been revived. I’ve signed it, as Kuenssberg anti-Labour bias is very obvious. Mike has previously put up an article showing that her discussion of one issue was nearly identical to a Tory press release, with but a few words changed. The BBC is supposed to be unbiased, but academic studies of the contents of their news programmes shows they’re far more likely to invite speakers from the Conservatives or right-wing organisations on to speak, and the general bias is much more to the right than other news broadcasts by their competitors, like Channel 4. And there is a movement within the Beeb to become overtly biased. I’ve mentioned before one article a year or so in the Radio Times in which the author discussed the possibility of broadcasters over here regaining ratings by becoming politically biased and abandoning impartiality, like Fox News. This isn’t a good role model. Fox News hasn’t got its monicker ‘Faux News’ for nothing. Somebody worked out that it only tells the truth 30% of the time, which means it’s effectively Murdoch’s own little Pravda for Republicans. it does not seem to me to be remotely surprising that the BBC should boast that it’s trusted the most by the managerial classes. It has a profoundly Establishment bias, reflecting their own attitudes and hostility to the working and lower middle classes. And I don’t think writing letters to the Beeb’s programme, Points of View, will help. This has had a number of presenters since it was set up in the 1960s, and is supposed to be a show where the Beeb responds to their critics. Private Eye has run a number of pieces on the programme over the years, commenting on how it’s subtly constructed to show that the BBC was correct in whatever approach they adopted to a particular subject after all, or that they had plenty of other letters applauding them or accusing them of the opposite bias. Part of this tactic involves not actually telling the audience how many letters from the opposite point of view they’ve received. If say, they’ve received 50 letters attacking a programme, and only five letters supporting it, Points of View will nevertheless present an image that the number of letter received from both pro- and anti- camps were roughly equal. The Eye has attacked the programme for being condescending, coming from the age when Auntie Beeb knew best, and its critics had to shut up and take what was good for them. The Beeb has a duty as a public service broadcaster to provide unbiased news, or at least, as close to unbiased as is humanly possible. The fact that they’re not is a threat to free speech and informed, public debate and political involvement. I don’t know if the petition to sack Kuenssberg will be successful. Possibly not. But at least it will show the Beeb that the great British public aren’t the naïve rubes they take us for, and that people are very much aware of their bias. If you feel the same, please take the opportunity to sign the petition above. This is the biggest threat to the BBC so far. John Whittingdale, the minister who’s deciding our BBC’s future, just announced he wants the government to choose the people who run the BBC. It means our most trusted broadcaster could be left in the hands of a government that wants to see it fail. Whittingdale sneaked out his devastating plan at the weekend, to a newspaper that’s behind a paywall. He knows that another scandal might put a stop to his plans to undermine the BBC for good. So he’ll be hoping that 38 Degrees members aren’t paying attention. We’ve got to act fast. If enough us sign an emergency petition demanding the BBC stays independent, 38 Degrees members will deliver it to him in person early next week. And exposing his plans in public will shine a light on his real agenda to dismantle our BBC. Please can you add your name to the emergency petition now? The way decisions are made in the BBC is under review. But John Whittingdale’s using this as an opportunity to push his anti-BBC agenda and put his people in charge. They would have the power to decide news coverage and which BBC programmes are made. It could mean the end of the BBC as we know it. Whittingdale’s feeling the pressure right now thanks to a series of damaging revelations on his plans for the BBC – including being caught lying about reading responses to the public consultation. If we turn up the heat now, Whittingdale will have no option but to back down. If thousands of us sign this emergency petition, then deliver it to him in just a few days, we could make Whittingdale realise that he’s fighting a losing battle and leave our BBC alone. This week could become the turning point in our people-powered campaign to protect the BBC. The petition can be signed at: https://speakout.38degrees.org.uk/campaigns/keep-the-BBC-free-from-government-control. If this is something you also feel strongly about, then please sign the petition. I’ve also done so. I’ve felt it was important to do so because Berlosconi in Italy and Sarkozy in France used state control of the national broadcasting companies to remove from the airwaves shows, reporters and comedians that were critical of them. In the case of Berlo, this was the satirical comedy show, Rayot, after the show’s writer did a skit satirising Italy’s most pompous and totalitarian Right-wing politico since Mussolini. She later made an arthouse movie out of the affair, Viva Zapatero, named after the Spanish president, who removed the ability of his office to nominate the head of the state broadcaster. If Whittingdale’s proposal goes ahead, not only will it give the government further leverage to privatise the Beeb, but it also means that, like the French and Italian state broadcasters, it will be under further government pressure to act as the government’s official mouthpiece. Not that it isn’t already spouting the lies fed it by the Tories. However, the situation will become worse. This, in my view, needs to be stopped. Now. The internet petitioning organisation, 38 Degrees, has launched a petition against George Osborne’s proposal to cut the Personal Independence Payment. This afternoon I received this message from them. The support he’s slashing, known as the Personal Independence Payment, is used by disabled people to help them live an independent life – for aids to help with things like washing and dressing. In other words, money needed to live with dignity. Conservative MPs are panicking. Some are already saying publicly that they don’t support taking this money away. George Osborne is looking isolated, and one thing 38 Degrees members can do right now is show the public are against his cruel plans too. The UK is better than this – better than taking money away from people who need it most. Taking away help to do the most basic things and live an independent life. People power can stop this cruel cut too. The more of us who rally in defence of people with disabilities, the more toxic we can make this for George Osborne, and the faster we can force him to back down. PPS: If you or a loved one are likely to be affected by these cuts, there is support available. The petition also includes sending an email to your MP asking them to talk to George Osborne about the cuts. If you want to aid the campaign against Osbo’s latest attack on the disabled, then please sign the petition. I’ve done so.